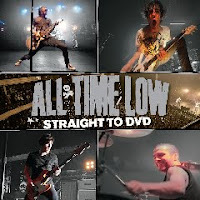 All Time Low performed last year at Hammerstein Ballroom on December 4, and now that performance is coming to a DVD and CD near you thanks to Hopeless Records with the band's latest release, Straight to DVD. On May 25, the DVD/CD combo will be released as both a standard (CD and single DVD) and deluxe (CD and double DVD) set. Both come with an assorted collection of goodies, and you can check out the track list of both versions after the jump.